A person alone on stage, even a stand-up comedian doing a practiced routine, always elicits reflections on mortality. I think it’s just the reality of the person standing there alone telling you his or her story — which is, in the end, all we have. These undercurrents are right on the surface in “Nice T!ts” where with impeccable comedic timing this story of loss and rejuvenation is told with visceral empathy by playwright/performer, Amy Marcs. This is her story. But she does something I have rarely, if ever, seen before. At times, she empathizes with us empathizing with her, almost as if to say ever so briefly with a pause or a gesture or a phrase, “Yeah, this is what happened can you believe it and I’m here telling it to you.” She has a curiously sophisticated rapport with the audience that grows in impact when you consider that some of those sitting in the dark have been drawn to the show by experiences similar to hers. 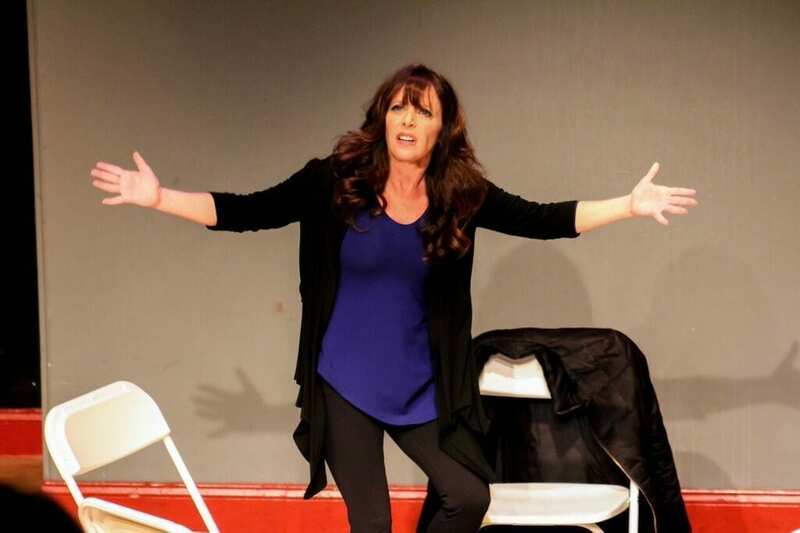 Breasts themselves are characters in this one-woman show. We can’t help but be reminded, whatever our gender, that these were our first objects. We can’t deny their iconic meaning, their societal and economic value, how they can make things happen. This is humorously driven home by none other than the voice and image of Barbie, the plastic surgeon of our attitudes. But on the serious side, these primary objects mysteriously become primary to the subjectivity of some of us. Then to have that part of your identity “ripped away” in the words of one of the cancer center voices Amy Marcs impersonates can only be devastating. This is how well-told stories work. The women in the audience immediately identify, whatever their experience. At first, the men are transformed into even more distant spectators, as if we weren’t already completely in the dark about what women are all about, but then Amy brings us all back, because this is a universal story about the losses that challenge our identity, which is not gender specific, because none of us is immune to events and the passage of time. She does this with humanity and humor, just what the doctor prescribed. Written and performed by Amy Marcs; directed by Peter Michael Marino; incidental music, Michael Bradley; associate producer, Sara Krieger; technical director; Christine Pynn; sound recording, Roy Renza; stage manager, Courtney Fostvedt; hair and make-up artists, Cassidy Horn; dance break, Tyler Lee; graphic designer, Wendy Lui; personal assistant, Ellen Ball. At The PIT LOFT – 154 W. 29th St (b/t 6th & 7th, New York City); 212-244-1722. ONE MORE SHOW, May 19, 8:00PM.